At first, teaching kids to golf can seem like a daunting challenge. I mean, isn’t golf hard enough for adults? The best way to break kids in to the game is by starting on the practice range and keeping things simple. By starting with some drills and fun games to build their confidence and teach the fundamentals, kids will quickly get familiar with the game. Below are a few drills and practice games that will be fun for the kids, all while helping them learn to play. Two Putt. This first drill is super simple but will teach kids a lesson about one of the most important parts of golf – getting down in two putts. To play this game, you and your child will just need one golf ball and a putter each. 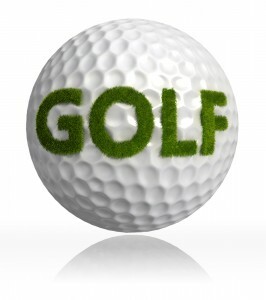 To start, drop your golf balls on the green and pick a hole to putt toward. The scoring is simple – a one putt is worth one point, a two putt is zero points, and a three putt costs you two points. You can play to seven, or whatever works best for you. The idea is by putting a bigger penalty on three putting, you teach the idea of controlling speed on the first putt and leaving a tap in to finish up. Range KP’s. This was my favorite game to play as a young golfer, and remains that way today. Start out by letting your child pick out a target on the range, and you each hit a shot toward it. Whichever shot is closer gets the point, and the loser gets to pick the next target. Go back and forth until someone gets 10 points (or you run out of range balls). This drill will help kids to focus in on a specific target and execute the shot under a little bit of pressure. Chipping Ladder. The short game, chipping specifically, is a crucial component of a young golfers development. To work on controlling distance on chip shots, try playing this game with your kids. Get several golf balls and a wedge each. Let your kid start by chipping the ball anywhere onto the green, but short of a target hole. When you take your turn, the idea is to chip past the first ball, but still short of the hole. If you are successful, the game continues. Keep chipping until someone chips short of the longest ball, or past the hole. Practice games and drills on the range are really only limited by your imagination. Two keys to keep in mind – make them short enough to keep a child’s attention, and give them a competitive aspect. The competition will serve them well in learning to try their best to win while playing fair at the same time. Having fun with practice is the only way to get a young person addicted to the game you already love. As they see their skills develop and start to win some of these games against you, the drive to keep on improving will only grow.